Capture Everything - The pulse Smartpen records audio and links it to what you write. Missed something? 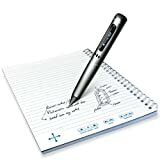 Tap on your notes or drawings with the tip of your Pulse smartpen to hear what was said while you were writing. No Need to Lug the Laptop - The Pulse smartpen automatically captures everything as you write and draw.